Elderflower wine is a traditional English drink made from the flowers of the Elder shrub or tree, which produces both flowers and berries. It has something of a legendary status that evokes images of paganism, drunken revelry and church fetes, somehow all at once! This is partly due to its long history and home brewing associations. It was at one point considered sacred, quite in keeping with the central role that wine has played in religious ceremonies over time. Myths both good and bad have revolved around the wine, including the belief that Judas Iscariot hanged himself from an Elder tree, and that Jesus' cross was made of elder. These stories were in all doubt invented to discredit the popularity of Elderberry's amongst native Britons during the Roman conquest, and their later Christian conversion. Other than these connotations, Elder based wines are associated with country side pantry – something of an image crisis in these days of fast City living. Elderflower wine, in fact is one of the most reasonable of the U.K's native drinks, perhaps deserving of a revival. It can be bought bottled for a reasonable price at farm shops and online. Elderflower wine has a light and crispy taste with citrus notes and is light yellow in colour. There are many variations on this classic British country wine, although essentially the main ingredients are Elder flowers, yeast and sugar. The Elder tree is very accessible in the UK, being found readily in parks and gardens. The drink itself is nit the easiest of wines to start with, and it is key that the right amount of flowers are used: too many and the final product will taste 'stewed'. Elderflowers and berrys are believed to have many health giving properties, not least due to their high vitamin C content. The flower is intensely aromatic, imparting hints of Muscat to the finished the wine. Elderflower wine is made by boiling up Elderflowers with sugar yeast, orange and lemon juice, before leaving to ferment for 4 months. Grape juice can be added to give the wine a more conventional taste. Elderflower wine is typically around 10-11% abv. Elderflower wine is an ideal accompaniment to summer salads when served chilled. 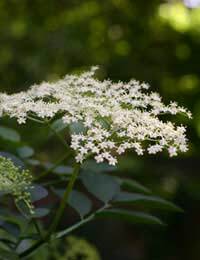 The light flavour of Elderflower is particularly suited to sparkling wine. Elderflower 'Champagne' (which is, of course, most certainly not a Champagne in the true sense) is made a in a similar way to Elderflower Wine but is second fermented to produce bubbles.This also makes an ideal and novel summer party drink. A similar drink can be made with the berry of the Elder. This drink is much closer to grape wine and is red in colour. It makes a good mulled wine, and is therefore ideal for winter. Elderberry wine is typically around 13-14% abv. With all of the above it is vital not to include any of the plant stems in the winemaking process as they are not edible. Be sure to strip flowers or berries from the plant itself.